Tropical Storm Julia developed overnight and will produce widespread flooding in portions of the Southeast as it drifts northward through Georgia and South Carolina. Some of your properties are in the storm's projected path and are at an increased risk of damage. If you are in need of SRM Service Master services please call the MediGroup Emergency SRM Hotline: 888.243.5760. Tropical Storm Julia will drift northward today, becoming a depression this afternoon and then continuing slowly northward into Thursday, before dissipating. Heavy rain will accompany the storm for portions of the Southeast through Thursday, with tropical enhanced rain bands expected to continue through Friday, before any influences of the storm subside. The hardest hit areas look to be far southeastern Georgia through far southern South Carolina, where widespread flooding will cause disruptions to logistical operations, power outages, and road closures. Rainfall amounts of 2 to 4 inches will cause local flooding across northern Florida, central through southeastern Georgia, and the southern half of South Carolina. 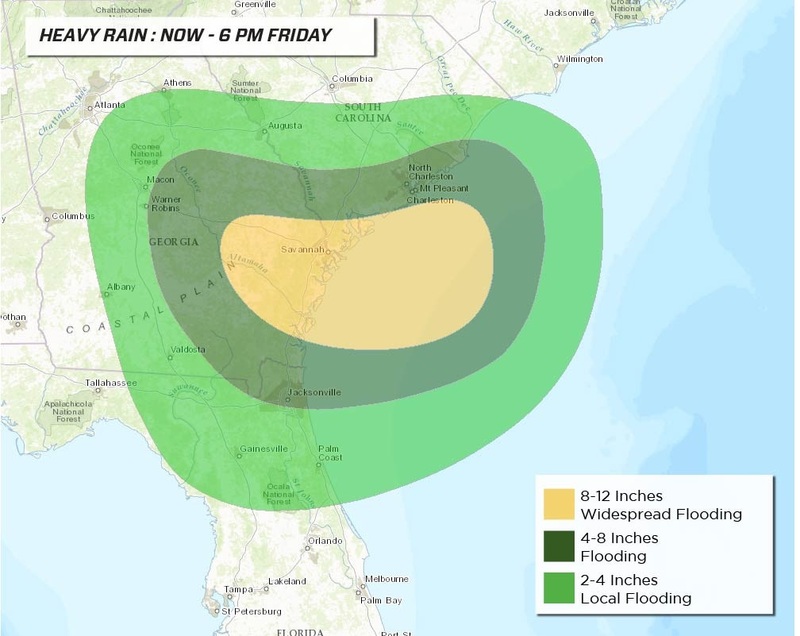 Rainfall amounts of 4 to 8 inches will cause flooding across far northeastern Florida, southeastern Georgia, and southern South Carolina. Rainfall amounts of 8 to 12 inches will cause widespread flooding across far southeastern Georgia and far southern South Carolina. Tropical Storm Julia will have strong winds associated with it along the eastern side of the storm. There will be gusts up to 55 mph near the coast. There can be some higher surf as a result of the strong easterly winds as well as some beach erosion. There is also a small risk for minor damage to unsecured structures.